A can opener is a must-have in all kitchens because it’s always needed to open cans. However, you don’t want just any device for this task. What you want is the best manual can opener that’s effective and efficient in performing its job. With a manual can opener, you really don’t need batteries or electricity to operate it. All you really need is some strength (very minimal) and effort to use it. However, getting a high-quality unit that’s reasonably priced is still your main goal. 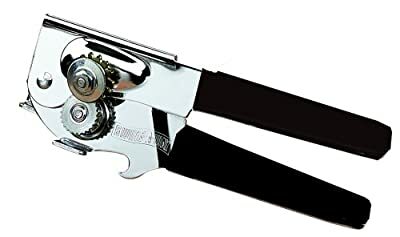 Which is the Best Manual Can Opener for the Money? When considering to buy a manual can opener, understand that you have 2 choices when picking the right model for you. 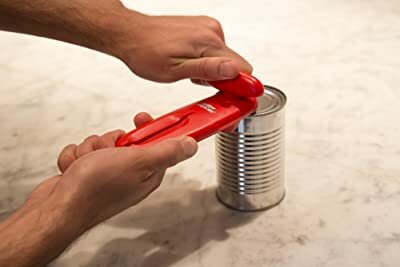 With a can opener that slices the top of a can, the lid will eventually fall into the contents of the can (unless the can is not totally opened). For this type of can opener, the lid will usually have rough edges that can cut you if you’re not careful. 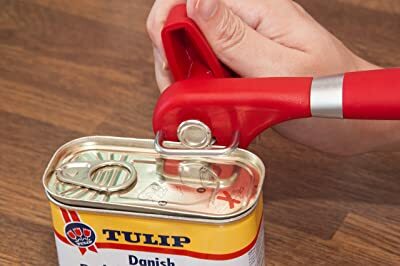 With a side opening can opener, the cut is usually made right under the rim of the lid of the can. This method allows for a cleaner cut – so, there’s minimal to no jagged edges. Also, the lid won’t fall into the content of the can, but can even serve as a cover for the already opened can. Unlike an electrical model of the can opener, using a manual can opener requires several steps. If you’ve never used a can opener before, the steps listed below can be your guide. Listed below are some of the things that you should look for in a can opener. The following points will allow you to have a more pleasant experience when using your manual can opener. 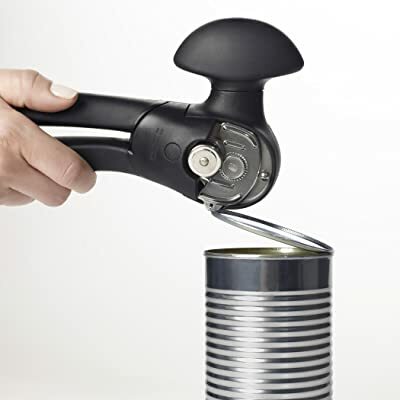 Ergonomically designed handle – As you will need to press and hold onto the handle while using the can opener, choose a model that’s comfortable on your hands. Easy to control – While a manual can opener is easy to use, it will depend on you to control it. Therefore, the cutting mechanism and knob should be easy to manipulate. Zero to minimal rough edges – For safety reasons, choose a model that doesn’t result in opened cans (and lids) that have jagged edges. 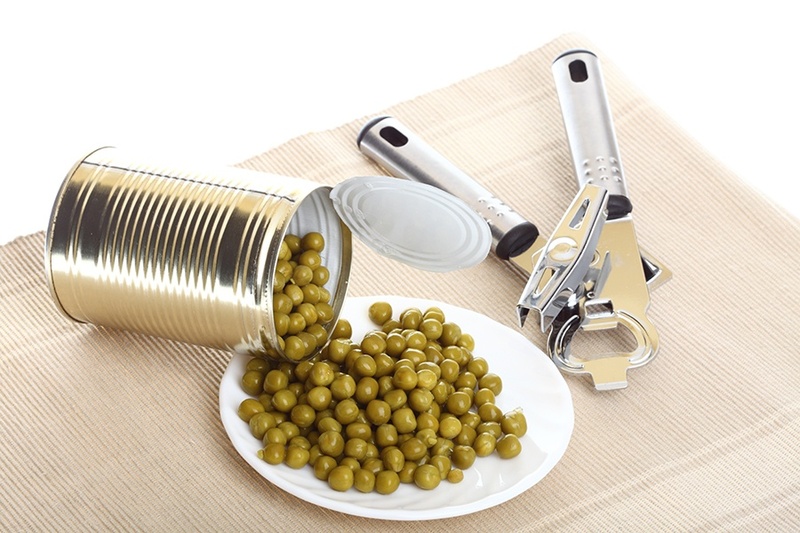 Contact with food – For sanitary reasons, it would be best if the sliced lid and the can opener itself will not have any contact with the food content of the can. Note: If the above points (disadvantages) are major issues with you, a manual can opener may not work for you. If that’s the case, consider getting an electric or battery operated can opener. Don’t just go out to buy a can opener. 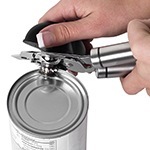 Go through this list of manual can opener reviews first to know about your many options. 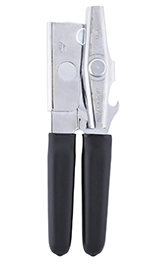 The EZ-DUZ-IT can opener is a top opening manual can opener. If you’re keen on buying it, it’s available in the color black. Cutting Mechanism – The cutting blades are made of carbon steel. Design – This is a gear-driven unit. Cleaning Procedure – Hand wash it with soapy water. The Good Cook manual can opener is a side opening can opener. It’s available in the color black. Cutting Technology – Using this model results in smooth (and therefore, safe) edges. Design – The cutting wheel runs through the sides of the can and won’t come into contact with its contents. Materials – It’s made of chrome construction. It only requires minimal strength and effort to use. Here’s another top opening model of a manual can opener. If you choose to go for the Swing-A-Way 470BK can opener, you have the option of choosing from 3 colors – black, white, and red. Handle Design – The handles are coated with soft materials. Knob Construction – The turning knob is made of metal. Portable Design – its size is ideal for home and outdoor use. Bottle Opener – The design of this model includes a built-in bottle opener. Cleaning Procedure – You can clean it by hand washing it. This simple can opener can do the job of opening cans effectively and quickly – that’s why it really deserves its spot at the Top 3 position on our Top 10 list. If you’re looking for a side opening can opener, consider the Zyliss Magican manual can opener. It’s available in green, red, and purple color. Powerful Design – It can take on any size of the can. Cutting System – The cutting mechanism is made of iron and stainless steel materials. Hygienic Design – The lid won’t fall into the content of the can since the cut is done on the side of the can. Lid Release Handle – The lid will remain attached to the cutter until the lid release handle is pushed. Cleaning Procedure – The manufacturer’s instruction is to wipe the unit with the damp cloth to clean it. The unit is safe to use as there will be no rough edges on the can and lid itself. While its side opening design is meant to keep the cutting mechanism away from the content of the can, there’s a chance that the blade will touch the food because it cuts so low. For another choice on a top-cutting can opener, look at the Kitchen Fanatic manual can opener. Knob Design – The turning knob is large and ergonomically designed for easy handling. Metal Loops – The handle has a built-in loop so you can hang it. Cleaning Procedure – You can wash it in the dishwasher or by hand. Bonus Item – It comes with a separate bottle opener as a gift. The Made in USA manual can opener makes for a good choice when looking out for a top-cutting can opener. It comes in the colors of black and red. Handle Design – It comes with handles that have thick padding. Materials – The handles and knob are made of carbon steel materials. Cutting System – The cutting blade, feeding wheel, and gears are all heat treated and plated with zinc. Cleaning Procedure – You can use the paper towel or cloth with soapy water to wipe it clean. The sharp cutting mechanism ensures smooth operation. This model is a can opener and bottle opener in one – that’s why I like it. The Zyliss lock n lift manual can opener is yet another choice for a top-opening model of can opener. You can choose from the following colors – green, white, and red. Cutting Mechanism – The cutting blade is made of stainless steel. Handle Design – Its handles are built with soft grips. Magnetic System – A magnet keeps the lid from falling into the can after the cutting procedure is through. Standard Design – It can cut cans of different sizes. Cleaning Procedure – You can wipe the cutting mechanism part with paper towel dipped in soapy water. 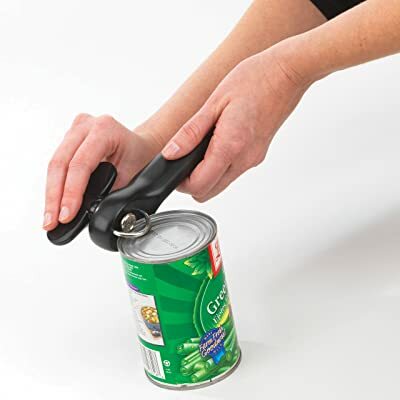 For another option in a side, cutting can opener, check out the OXO Good Grips manual can opener (video). It’s, only available in black color. 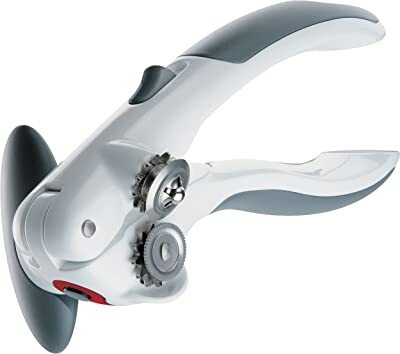 This model of can opener from OXO is able to cut the can right under the lid – thereby ensuring clean cuts with no sharp edges. This KitchenAid manual can opener is a top-opening model. If you like its design, you can choose from many different colors – such as black, white, blue, red, orange, etc. This model of manual can opener from KitchenAid needs to be angled correctly in order for it to cut effectively. Otherwise, it may skip certain portions of the can during operation. 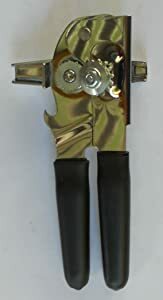 The Top 10 spot in our list goes to another side cutting model of can opener. The Ace manual can opener is available in the color red. Handle Design – The handle is round-shaped for comfortable handling. Operation – To cut, turn the knob forward. To release, turn the knob backwards. This cute red can opener is a functional model, but getting used to using it can take some practice. 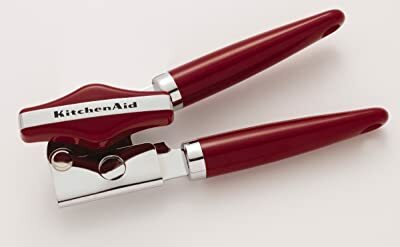 To wrap it up, I am going to recommend 2 models of manual can openers to you – one top-cutting model and one side cutting unit. As you can see, the Top 1 slot went to the EZ-Duz-It manual can opener – which is a top-cutting type of can opener. It comes with a simple gear design that’s efficient and easy to use. Also, for a top-cutting model, the resulting edges from using it are not that sharp. It really is very inexpensive, too. 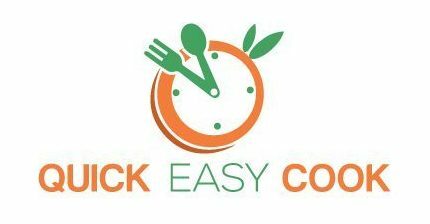 The Good Cook manual can opener is in the same price range – and just as functional as the EZ-Duz-It model. This is a side-cutting unit, and can, therefore, deliver cleaner cuts. I like its design because it's more hygienic. Do let me know which one you’re going to buy and why, ok? It’s perfectly alright if you prefer the other models over my 2 suggestions, too. As always, I urge you to share this post with other people who are also looking for the best manual can opener for the money.